Few have made mention that trainer Bill Mott’s birthday is Opening Day at the Spa Course. This helpful bit of handicapping knowledge comes to you with no strings attached. Last summer was a rare Saratoga in which Mott didn’t saddle a winner on his birthday. This year, with Come From Behind in the fifth and Antenna in the seventh, as well as Auteur in the first and Evolutionist in the fourth on the Also Eligible list, things could get back to normal. Thoroughbred racing has been normal behavior in this city since the summer of 1864. And, for those unaware of it, a brand new sign in bright red and white at the top of the racecourse’s clubhouse is there to alert them. The old pinnacle-roofed plant has been buffed to a cozy rub and a smattering of high-definition flat screen TVs have been hung on a few walls to make race watching vivid. Restaurant Row features an improved handsome wood-paneled look. The backyard has grass and someone has swept up the moose droppings. Operations manager Kevin Gremillion, one of a growing number of NYRA operatives with hair that’s not silver, brought in 350 carpenters, painters, electricians and landscapers to renew grace to these grounds. In addition, Gremillion’s hard-working crews installed 900 feet of 36-inch drain pipe to stop the last turn from washing out when the big afternoon rains thunder down from the Adirondacks. Over two dozen years have passed since the Carousel Restaurant was built - the last time the grandstand was altered. Several people in charge are itching for Aqueduct VLT dough so that they can make the next round of changes. But legislators won’t decide which group is best fit to run the eight-years-in-the making racino until all the fund-raising is done, of course, and that won’t get finished before Labor Day. As one might expect from beefy men who sweat when they walk 20 feet, the most popular plea is to add more air-conditioned spaces. But a new dining structure to rest on the clubhouse turn, a tiered viewing area for the walking ring and the conversion of the old paddock edifice into something more reminiscent of an historic era are the projects most spoken about. In regard to today’s 10-race card, it’s over-subscribed and packed with intrigue. Two-year-old fillies headline the feature as 13 lightly-raced speedballs will try the 91st running of $100,000 grade III Schuylerville Stakes. Starter Roy Williamson will send maiden juveniles running from the gate on two other occasions. In addition, the third race is a minor black-type event for a purse of $80,500 - that’s if you consider such multiple stakes winners as Pyro and Silver Edition, both entered, less than major. 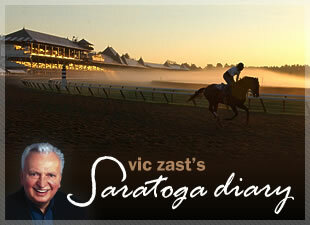 Vic Zast has been going to the races in Saratoga for over 45 years. He is an owner, breeder and former racetrack executive as well as a regular contributor to The Blood-Horse publications among others.